Some financial institutions are falling short in their Development Operations (DevOps) cryptographic security practices. In DevOps, cryptographic security risks are amplified—compromises in development or test environments can easily spread to production systems and applications. A study of the financial services DevOps teams shows they are more aware of security risks and tools than other industries. However, this awareness isn’t being translated into meaningful protection. Learn how your DevOps cryptographic security practices stack up and compare to other industries. Understand how automating and orchestrating certificate acquisition as part of your DevOps environment can help keep your business secure. Learn how DevOps cryptographic security practices in the financial industry compare to other industries and understand how automating certificate acquisition can improve security. 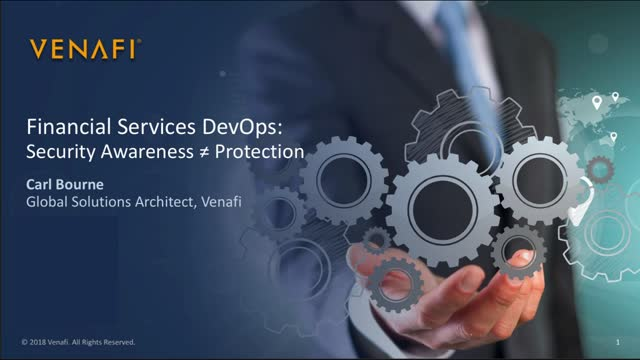 Join Venafi as we discuss DevOps cryptographic security practices.